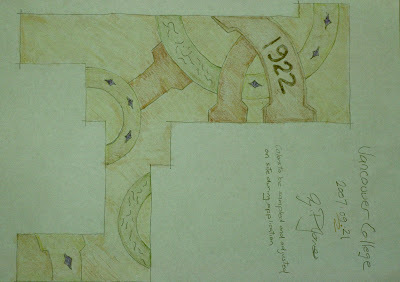 I thought it would be a good time and have a look at an old Arapido project. Back in 2007 we had 2 years of successful project testing with this new product and felt it was time to put it to the real test.....the heavy demands of a large boy's college. With decorative concrete finishes we had a opportunity to give the College a chance to present their heritage with the present in the new school extensions. 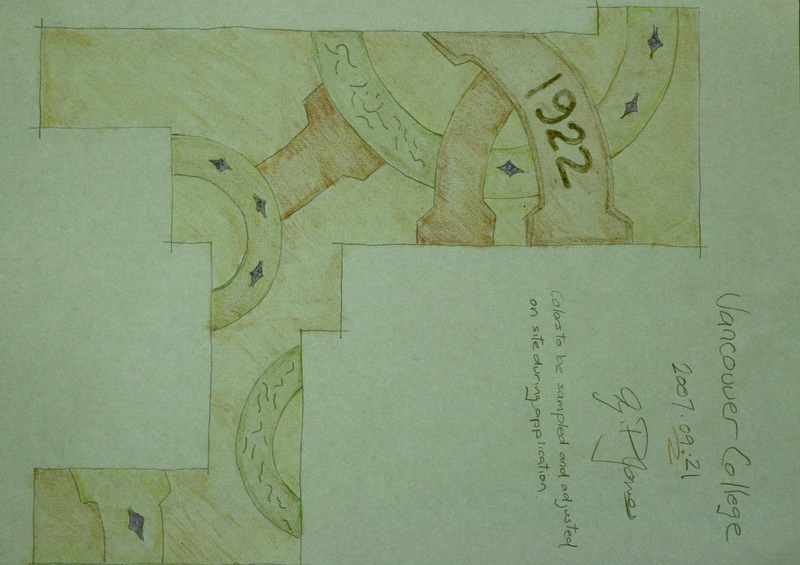 With Bjorn Olner we worked on a concept of deconstructing the school crest and using aspects of it in the new floor. Bjorn Olner's original watercolor drawings for the foyer. We chose gold as the main field color's as it was used in the college's uniforms. The first task was to lay out the design and spray on the Arapido which had a fine combination of Silica hardeners and pearlescent powders broad-casted to provide extra hardness. 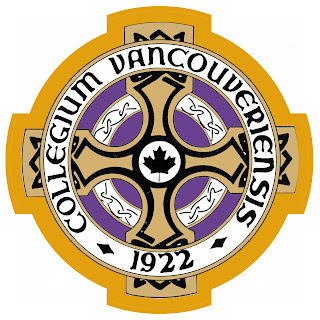 Large graphics depicting aspects of the crest and in this case the opening year the school was established 1922. 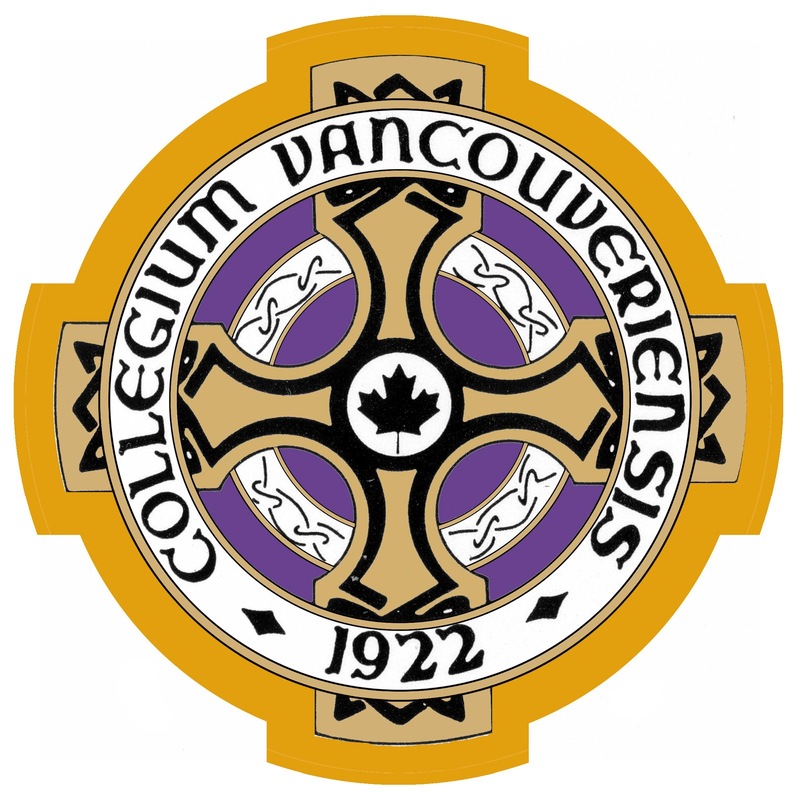 Purple was the predominate color used in the college uniforms. The school demanding foot traffic has had no effect on the Arapido surface, since its inception in the school another two renovations have seen the material used. 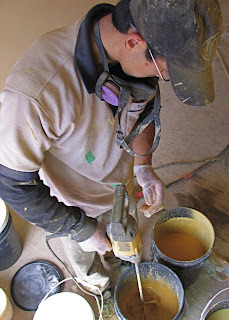 Tony from Melody Concrete mixes the arapido cement with 4.6 liters of CP 2008 polymer for 2 minutes. Allows it to sit for a couple of minutes ...re-mixes for 45 seconds minute. He uses a fine screen to pour it through prior to filling the hopper of the Arapido sprayer. Do not mistake this with the Stucco hopper gun system! that systems spatters the coarse material on with air, and then knocked down with a trowel to give a stucco finish. The Arapido gun puts on a very smooth fine cement finish without air .....thus having real concrete characteristic. The freshly sprayed Arapido cement is very lightly textured with magic trowels to give movement and a fresco finish... the desired look. "Its time for a Self-Level"
Even though this surface needed to be level with the adjoining tile, the surface had been so poorly place that it still would have required a self leveling cement like Level 1. Arapido requires a much smoother substrate. 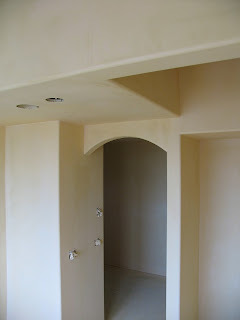 Remember the newly sprayed cement goes on very thin, and any physical deficiencies underneath would not be hidden. 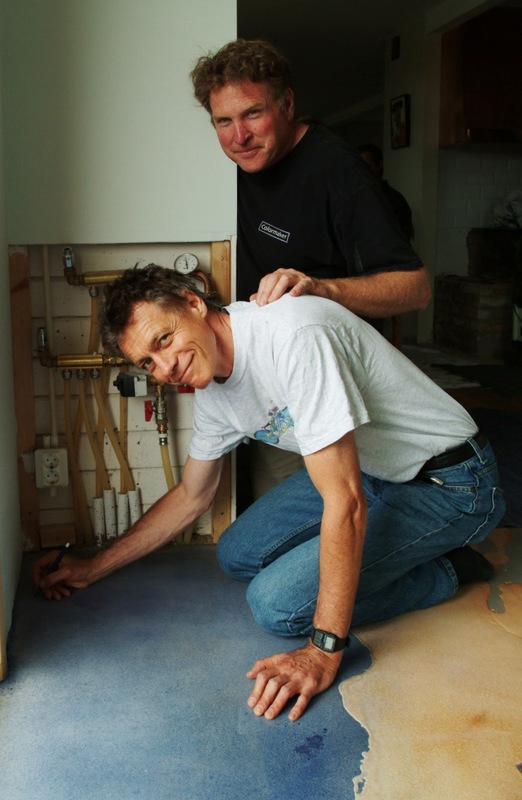 level 1 brings the concrete floor up to the level of the tile, and at the same time eliminates the heavy trowel lines. Prior to installing the Arapido over the self level, the floor must be primed with CP2008. This will stop air movement up through Level 1, plus bond the two surfaces together and allow the Arapido to hydrate as required. The Process: involves a layer of Arapido, including Cast-on and then polished the following day with 100 mesh dry diamond pads. Then another layer of sprayed Arapido over a hand cut card board graphic....this time no Cast-on, thus producing more surface contrast. With this second layer, a 200 mesh Diamond pad polished the last graphic even finer then the first layer. 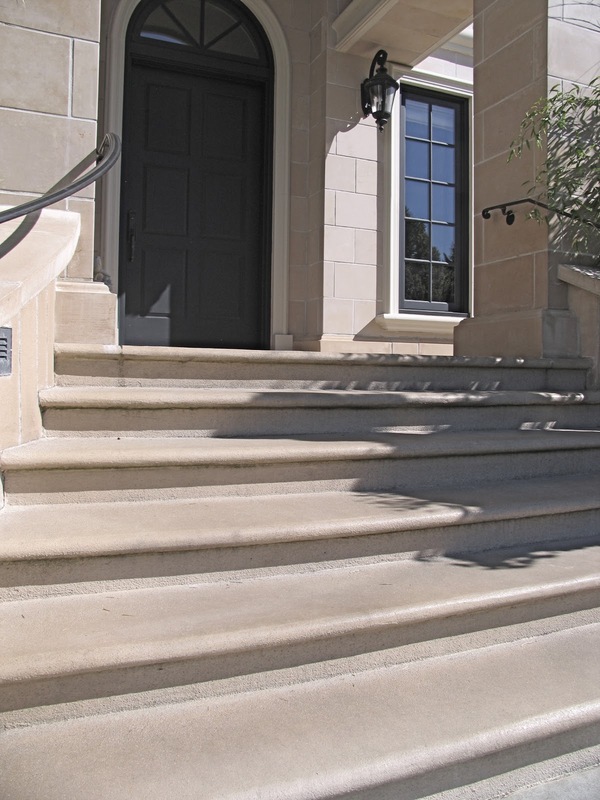 The original steps were poorly installed with typical gray concrete once the various deficiencies were patched and ground the Arapido spray pump makes fast work of resurfacing. Typically resurfacing these 10 bull nose steps would take the best part of an afternoon,with the Arapido sprayer the job was completely resurfaced in 10 minutes not including the patching. 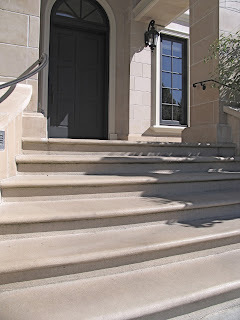 The smooth finish produce by the sprayer had a broadcast of Cast-on to give a fine sandstone appearance to match the visual of the sandstone walls and to create a nonslip factor. A pretty daunting task at this stage. The old crumbing concrete floor needed to be removed to allow for a complete renovation including raising the house and new foundations. Joanne inspecting her new Garden suite even at this stage she had visualized the finish needed for her furniture. the photo gives a glimpse of the abuse a new concrete receives during construction. What makes this interesting is that the white Arapido cement floor with the Terrazzi finish absolutely suits Joannes fine antique furniture in her garden suite. The SST Cast-on in the project had a combination of fine silica's, red glass and small white marble chips. What is an Arapido Sprayer? this airless spray pump was developed for spraying cement based micro resurfacers . Eliminating many of problems and difficulties associating with hand tools and the materials used . with finger touch quick release for easy clean up. Quick release high pressure hose with pressure gauge. Magical when it comes to stairs and those difficult areas. The problem: the exterior pool deck was poured at different times during construction, resulting in two totally different colored concrete slabs with differing porosity's. Staining these concrete pours, trying to pull them together was fruitless .Finally the customer got what they wanted Arapido sprayed over entire surface. A combination of aggregates were cast on during the installation of the Arapido to give the surface a nonslip sandstone finish. 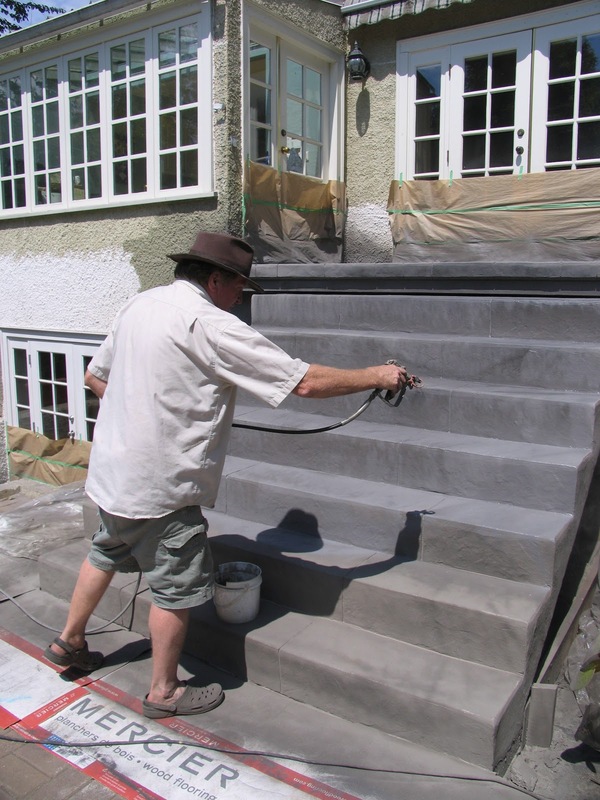 A elegant sutle yet practical color and finish for this exterior application. The following day, torn cardboard strip protects the surface, and then another layer of integrally colored Arapido cement sprayed either side. 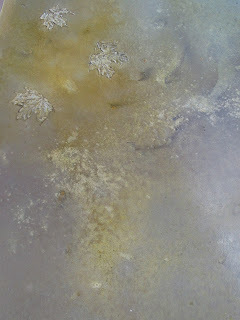 The beautiful organic result obtained using translucent Deso cement dyes on Arapido cement. 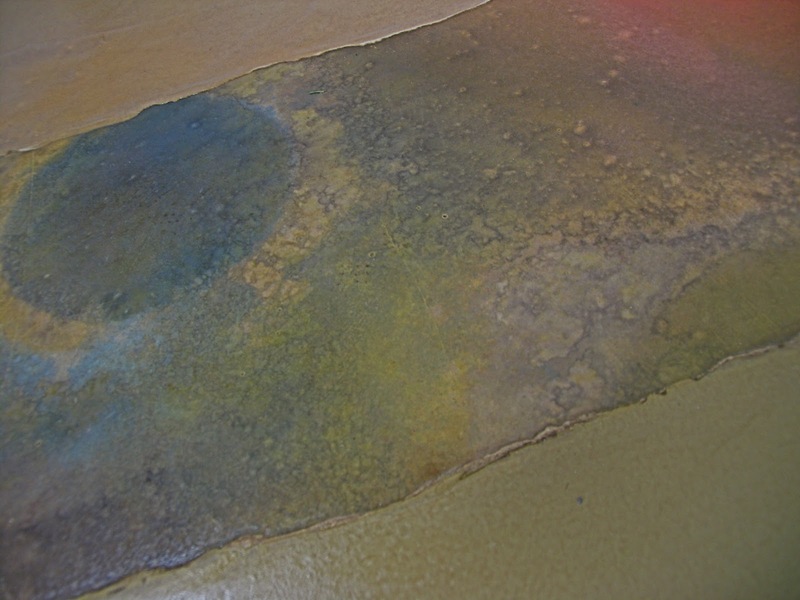 Using sawdust resist to manipulate and protect the primary colors during the process creating a mysterious depth. It was critical to avoid contaminating the blue areas during the process, as we all know any yellow would have turned it to green. creating an interesting interaction between the cement, dye colors and the imprinted leaves. The different color layers suggest depth, which is further enhanced by the color gradients in the individual layers. It was decided not to use white color-hardener for finishing the concrete, this would have been too difficult to protect with all the heavy construction in progress.The building was also very old and had a lot of oil contamination in the adjoining spaces which would have ruined the white concrete finish. The final decision was to apply Arapido just prior to opening. White Arapido was the choose, as it would equal the ascetic's attained with white cement and could be applied at the end of construction, eliminating the need for protection. The Arapido is applied over an old repaired self-leveled concrete floor to complete the renovation. The following day the new floor was sanded with 120 mesh screens. The final floor showed no cold joints, even though the runs where over a 100 ft. long . 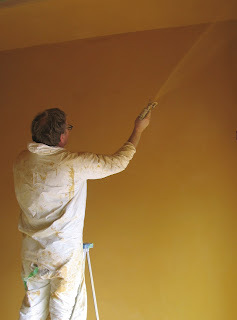 and the sprayer eliminates those unsightly trowel and smoother lines. The new custom colored surface was applied with an Arapido spray pump.....take note how the surrounding masking should be at least three feet to eliminate any over-spray. The latest in decorative concrete resurfacing... With the Arapido sprayer, now its possible to resurface existing stamped concrete... without loosing the original textured profile. We all love polished concrete but it does have its limitations sometimes. Arapido Cement, the micro topping that can be polished eliminates many of these issues. Consistently we visit sites where plumbing and trenching has been necessary, leaving a unacceptable visual result.....the new inlay is off different color and porosity . 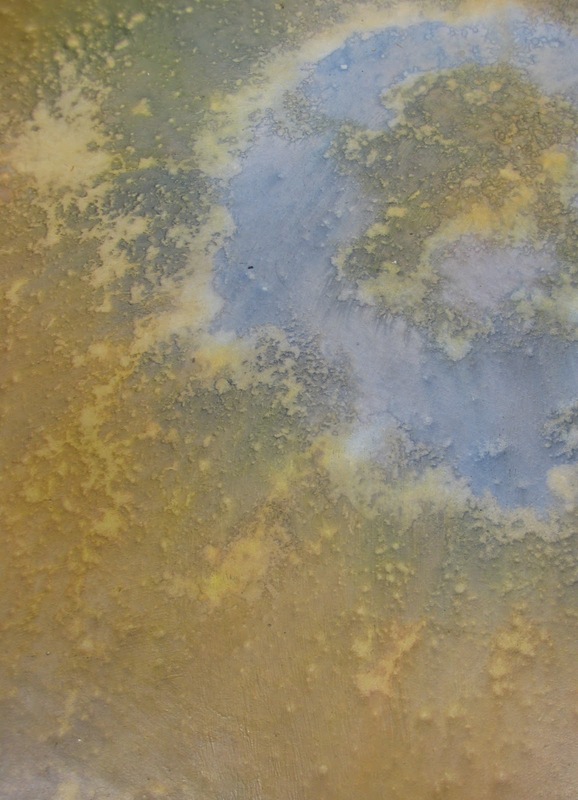 Another issue is the colors that can be attained with your standard grey concrete slab, using concrete dyes or stains are options but they tend to be limited in selection especially when trying to retain the natural transparency of the concrete. Most importantly the standard of the concrete surface is not suitable due to many factors including curing ,rainouts ,cold joints and just the general standard of workmanship. 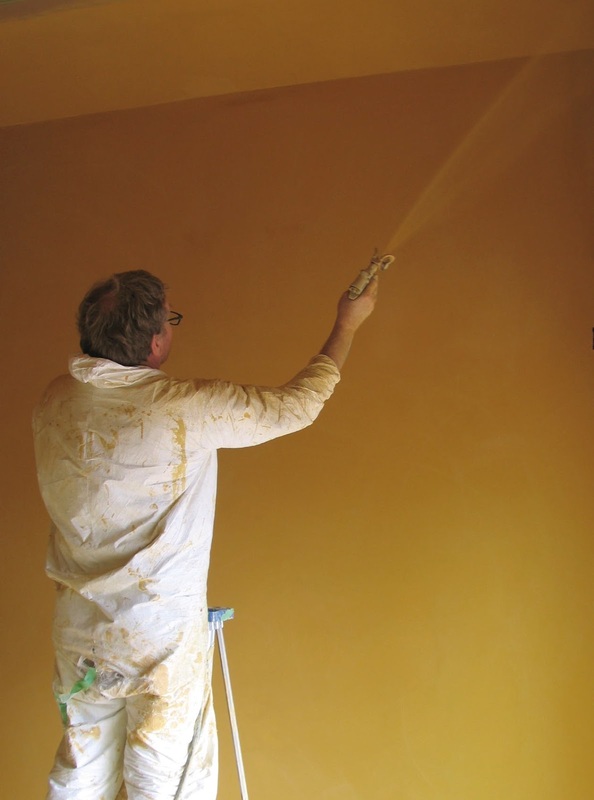 Sprayable micro topping cement powder that can be coloured and polished . Ideal solution when a new concrete surface is needed over the existing concrete or wood sub-floor.Very user friendly and installer can produce consistent results on both horizontal and vertical surfaces. 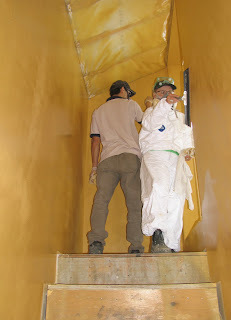 An airless, pump developed for spraying Arapido cement, resulting in a very smooth fine surface . Eliminating many of the installation problems and difficulties associated with hand trowel tools and the materials used .